The third part of one of the best series of battles created by Team Ninja, creators of the cult Ninja Gaiden, among others. The million-selling fighting game from Tecmo, Dead or Alive 3 has gone platinum! Experience the game that took fighters to the next level and gaming editors praised as the future of fighting games! Boasting state-of-the-art graphics, awe-inspiring interactive environments, an incredible 4-player tag battle feature, and a cast of gorgeous female characters . . . Dead or Alive 3, is not just a fighting game but a phenomenon! Don't be stuck in the past . . . The future is here. Are you ready? Dead Or Alive 3 offers a host of new features, including characters, lighting effects, muscle and clothing animation, interactive environments and much more! Players choose from a variety of new and returning characters to engage in hours of frenzied fighting. Up to four players can battle it out in multi-player mode, while single-player mode offers many expansive levels to explore. 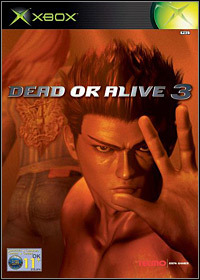 Dead Or Alive 3 is the fastest, most exciting, technologically advanced fighting game on any platform, with stunning graphics and an easy-to-play interface. The destructible, multi-tiered fighting environments, kinetic tag-battle feature, and gorgeous female fighters make Dead Or Alive 3 the ultimate fighting game. Are you the last person on Earth who still doesn't have DOA3? Don't be left in the dust! Get it today and find out for yourself why Dead Or Alive is the hottest game around! Game score 8.3 / 10 calculated out of 62 players' votes.